On Thursday, Feb. 21, the District Department of Transportation will be holding the first public meeting for the Barney Circle – Southeast Boulevard Transportation Planning Study. The meeting will take place from 6:30 pm – 8:30 pm at Payne Elementary School, 1445 C Street SE. Is DDOT committed to building a full traffic circle at Barney Circle, or is the agency considering other alternatives? What will a full traffic circle mean for traffic along surrounding streets? Will Kentucky Avenue remain one way? How will bike traffic proceed around the new Barney Circle? Would building a full traffic circle exacerbate the current traffic situation on 17th Street SE? What will DDOT do with the middle of the new Barney Circle? Build a park? Monument? Garden? Would 13th, 14th and 15th Streets connect to the Southeast Boulevard? Is DDOT still considering the construction of Park Drive, a roadway that would connect Independence Avenue to Barney Circle? What is the timeline for the project, and is it fully funded? Again, I encourage Hill East residents to attend this meeting, particularly if you live south of Potomac Avenue and east of 14th Street SE. This entry was posted on Monday, February 18th, 2013 at 3:45 pm and is filed under Barney Circle, Transportation. You can follow any responses to this entry through the RSS 2.0 feed. You can leave a response, or trackback from your own site. During the 17th and 19th St. meetings, DDOT constantly said that 17th St. would see reduced traffic when the “illegal” exit was shut down because drivers from the NE direction would be forced to use the appropriate 295 Anacostia Freeway to get to SE/SW Freeway. The justification was that Anacostia Freeway was the appropriate route. There has been some substantial money invested by DDOT for that route. It has worked to some extent for 17th Street and the next phase of measures for 17th St. should make it more palatable to live near. Now, if this Barney Circle plan allows one tp drive down 17th St and get on the SE/SW Freeway, it essentially encourages those drivers to once again use 17th St SE as a speedway through a residential neighborhood to get to SE/SW Freeway. The neighborhood has high child traffic from schools in the vicinity and a large playground on 17th/Mass/C streets, plus high adult foot and animal traffic with Congressional Cemetery. This result of more speeding cars is noise, litter, pollution, endangered people and animals, and lack of community enjoyment. Rhetorically, what is the purpose of our community? Is it for those who live in it to be safe and at peace, or those that need to commute through it instead of using the huge highways made for that purpose? This proposal gives commuters an option for passing through the neighborhood at a high rate of speed, instead of using the large freeways built for such uses. Thumbs down. I think connections of 13th, 14th and 15th streets to SE Boulevard is a very important question, particularly as those streets would likely have stoplights reducing the temptation to use it (and 17th St) as an alternative commute route. I also think we should push DDOT to maximize bike/pedestrian connections between SE Boulevard and the river (Boathouse Row). I realize the CSX tracks are a major obstacle in that regard, but would hope that additional pedestrian crossings are a concession we should be able to extract in return for the disruptions caused by the VA Avenue tunnel. Perhaps they could lower this section of tracks too, allowing DDOT to completely deck over them, making a seamless transition to the waterfront. 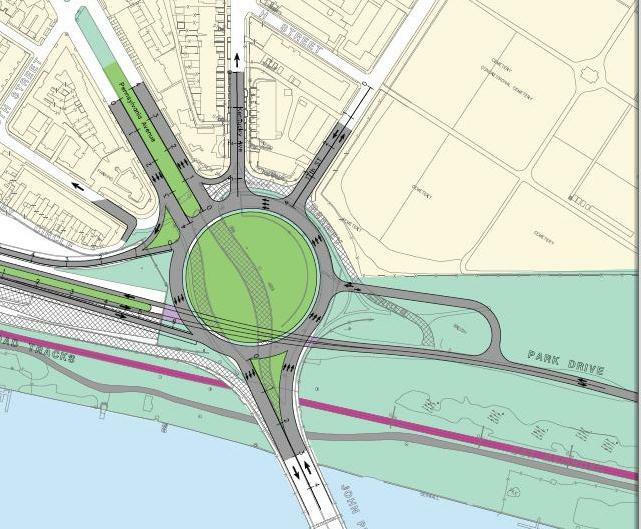 That diagram also seems to imply there will still be an underpass for traffic to RFK. I hope we can avoid turning that route into a commute speedway. It will make the Anacostia waterfront trail less pleasant to use and separate the Hill East Waterfront development from the river. Making all traffic navigate the circle would better emphasize that these are neighborhood streets, not commute routes.